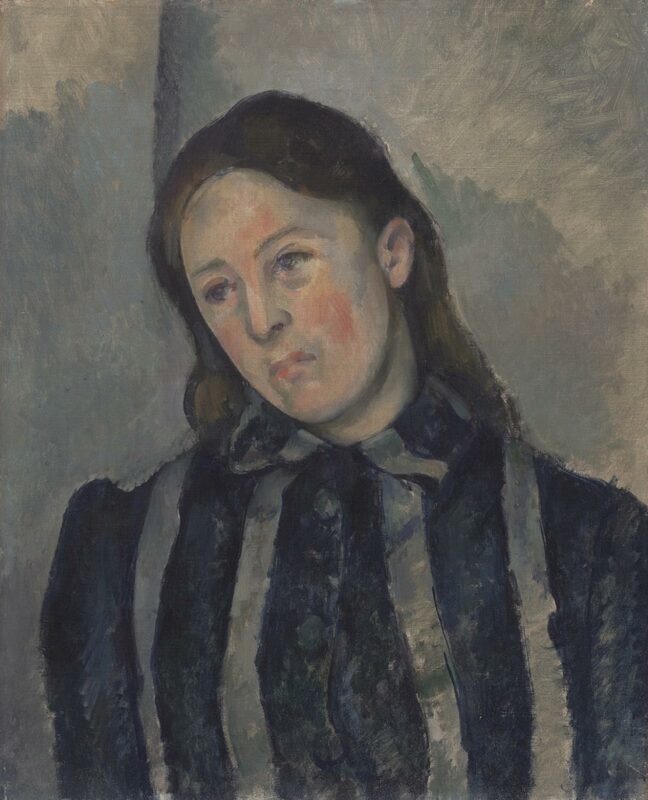 Paul Cézanne met Hortense Fiquet in Paris in 1869, when she was a nineteen-year-old artist's model. Their only child, Paul, Jr., was born in 1872; the couple married, perhaps as much to please Cézanne's dying father as for any other reason, in 1886. From what little is known of their lives, their relationship was difficult, and she certainly never comprehended the importance of her husband's art, although she did sit for him for some forty-four portraits. For all the formal power of these images, which often, as seen here, have a sense of volume in space that is nearly sculptural, they are also among the most moving portraits of the nineteenth century, a quality that is never more evident than in this melancholy and haunting picture. Joseph J. Rishel, from Philadelphia Museum of Art: Handbook of the Collections (1995), p. 208. With Ambroise Vollard, Paris; possibly Walther Halvorsen, Oslo; Gottlieb Friedrich Reber, Lausanne; with Paul Rosenberg, Paris, by 1926 ; Samuel Courtauld (1876-1947), London, by 1929 ; with Paul Rosenberg, New York, by 1930 ; sold to Henry P. McIlhenny, Philadelphia, by March 1934 ; bequest to PMA, 1986. 1. Exhibited at French Gallery, London, "Great Masters of the French XIXth Century [Rosenberg Collection], 1926, no. 2. 2. See Marie Dormoy, "La Collection Courtauld," L'Amour de l'Art, vol. 10, 1929, illus. p. 17; and J. Manson, "The Collection of Mr. and Mrs. Samuel Courtauld," Creative Art, 1929, p. 262. 3. Rosenberg lent the painting to the Rhode Island School of Design exhibition, "Modern French Art," 1930, no. 4. 4. See letter in the curatorial file dated March 24, 1934 from the Art Institute of Chicago to McIlhenny requesting the loan of the painting (see also letter in file from McIlhenny to his insurance agent dated May 6, 1935, in which he notes Rosenberg as the source of the purchase). Provenance per John Rewald, The Paintings of Paul Cézanne: A Catalogue Raisonné, New York, 1996, no. 685.